In the meantime I'm doing happy dances at the thought of my quilt travelling around and being part of a wonderful group of quilts. Yippee!! The tour kicks off this weekend in Atlanta!! No doubt all the quilters there are already planning to go. Who can resist seeing those wonderful quilts, sewing workshops and maybe doing a bit of shopping too. Here's a list of all the dates for Original Sewing and Quilting Expos around the US so you can see when the Expo will be nearby and you can pop the dates in your diary. The Exhibit will also be going to the Road to California Show in January 22-25th 2014. Phew!! That's quite a list of dates!! And what a great tour of the US!! If only I could travel with along with the quilt too. I was thinking that if any of you go to the show and see my quilt I would love it if you took a photo of yourself with my quilt and emailed it to me. You could wave at me if you like. It would be fun to know my quilt is having lots of friendly visitors. I am positively jealous that our American friends are getting to see your wonderful quilt, and I won't! Congratulations Rachael! You SO deserve this amazing honour! I hope they look after your beautiful creation for you! congrats thats so exciting oK how come its not coming to NYC or around here or Boston???? I am thrilled for you a road trip may be in order. hopefully Victoria is looking for a venue closer to her home! ok Worcester Mass is close enough! I am so excited put it on my calendar look forward to seeing this beauty in person , wow! How exciting and well done. You must get to one of those expos! rachel! wow oh wow!!! congratulations! if i'm on the other side of the pond which could happen, i will be seeking this tour out! i love your fresh twist on this classic! it's totally my kind of good time! i'm curious... what kind of feedback do you get from let's call them.... 'traditional quilting purists'. are they supportive or tisk-tisking you? I love this quilt! I am going to try and get to the one in VA this October! Congratulations Rachel - we can only hope the exhibition makes it over to Australia too. This is fantastic news!! Congratulations. It's a super quilt - definitely deserved to be in that bunch! Oh wouldn't it be lovely to travel along? Sigh. WAHOO!!! Congratulations--that is so exciting. Wish I lived closer to the places listed, but you never know where I might end up! Congratulations Rachael ! That is super news for you ! I'll be going to the one in Fort Worth....so if I can't meet you, your quilt will be the next best thing. Just the START of more great things to come. Since I can't go home to Worcester Ma to see it I'll have to wait for it to return . Wow -- that quilt is gorgeous! And the expo has expanded to so many cities -- I remember when it only went to a few. 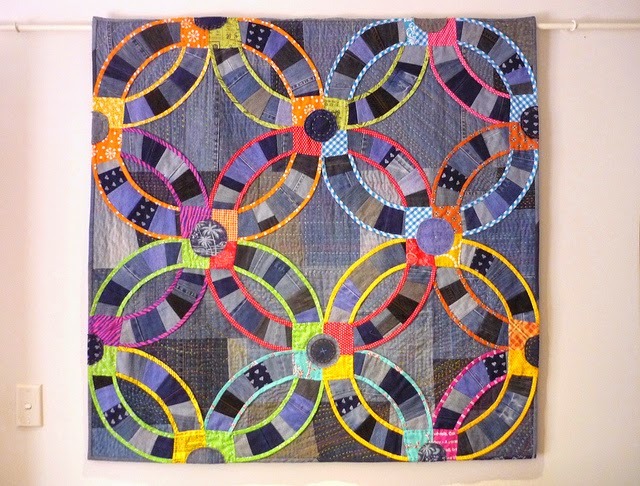 I spy a city within a few hours of me next spring -- maybe I'll be lucky and get to go -- I'd love to see your quilt! YAY for you, RD! And so exciting! I'd love to see this one up close & personal -- let's see, Fort Worth? Or maybe I could visit my mother-in-law & see it in Kansas. That's so exciting! That means I will hopefully get to see it somewhere! Congratulations! Yea! Very exciting! Great idea to have photos of your American friends visiting your quilt. None of the locations are near me, but you never know! I would love to see it up close. I'll be going to the one in Atlanta this weekend! I can't wait...I'll be sure to find it. How exciting! Completely deserved! Way to Go Rachael. That's such fantastic news. Congratulations!!! How exciting and what an honour for you!! Can you not squeeze into the packaging??? Sending you a BIG congratulations HUG! So happy this quilt will travel. It's wonderful. Congratulations Rachael. How exciting! Sounds like its going to be a long time before that quilt comes home to Oz! Wow - what an honour! Of course, your quilt is exquisite. I hope you get lots of fun photos! How exciting! What an amazing thing to happen. No wonder you are thrilled. As you say, it would be wonderful if you could travel along with your quilt so I hope people do send you in photos of themselves standing beside it. It would make a very interesting record. Bonnie Hunter of Quiltsville blog lives near Greensborough NC. You should email her the details of your Quilt's Itinerary and she could get the word out on her blog. Your quilt would get even more visitors then. Well indeed, Double Wedding Ring has turned into double, triple, quadruple happiness to you. And now it's spreading the happiness too. Well done you. WOW - Congratulations dear Rachael!! Fantastic news, Rachael!! Just brilliant! 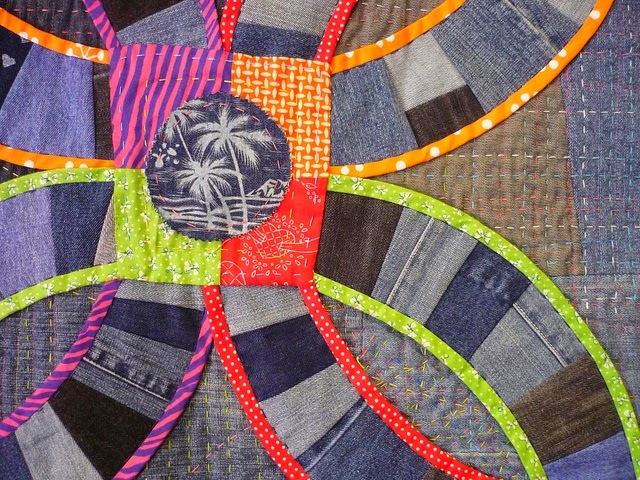 And love your entry too - you are one of the most innovative quilters I've seen. Any chance you can get over to the USA to see your quilt hanging?? Congratulations! It's such a beautiful quilt - I'm delighted the world will see it! I hope your quilt has a great time touring the US. I wish you were too - I'd meet you somewhere. congrats on having your wonderful quilt included. Wouldn't it be lovely if you got to go too, And meet Victoria FW? Congratulations!!!! OMG Rachael how exciting for you...I'm busting with excitement for you! Congratulations ....oh wow!!!!!!!! I'm doing a little happy dance for you! How exciting! I'm so very happy for you to have this quilt in the spotlight. Congratulations!! This is more than exciting. I am really thrilled for you. So lovely that your wonderful work can be seen by so many. Yay!!!! Congratulations! Maybe I can remember to travel to Cleveland in March to see it!! Yay! Wow, now that IS exciting news. If only you could travel with it, imagine the places you would go and the people you would meet! Enjoy, you will get lots of fan mail!! That is totally awesome. Bummer that you cant go along for the ride. Congratulations, it is an amazing quilt and I'm so pleased that so many people will get to see it in person. SO exciting! It definitely deserves to be on tour! Super congrats! LOVE your quilt too! I'll try to see it up close and personal and send you a photo! Congratulations! What fabulous news! I am so pleased for you. It is a shame you can't tour with it. That would be so much fun. How exciting for you. 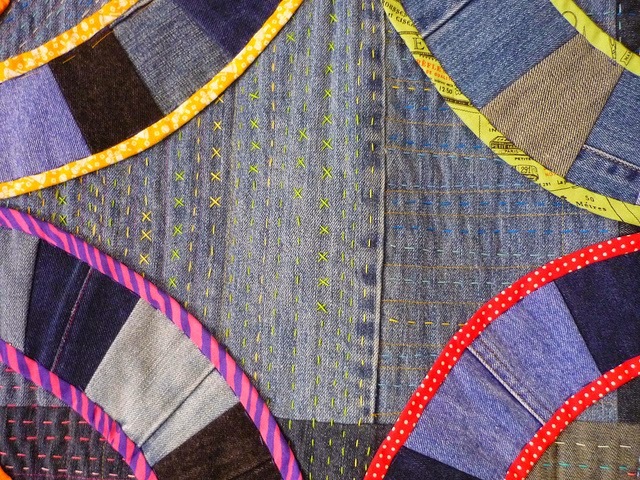 Here's hoping you receive lots of photos of your quilt as it travels around.